Marine traffic such as high-speed passenger vessels, naval ships and expanding commercial whale watching were all increasing in the late 1980s, which posed increasing risks of collision and disturbance to marine mammals in the area. As a result the Pelagos Sanctuary - a transboundary Specially Protected Area of Mediterranean Importance (SPAMI) located in the North-western part of the Mediterranean Sea was proposed. To limit possible negative impacts on cetaceans within the sanctuary, specific restrictions have been implemented. Story 2: Shipping routes in Swedish waters under investigation. Research has shown that some intensively used shipping routes in Sweden have negative impacts (disturbance, oil spills etc.) on these species because of physical and noise disturbance and chemical pollution from oil spills. Due to the importance of these routes for Swedish and international maritime traffic, they Swedish Transport Administration claimed them as ‘areas of national interest’ in line with the Swedish environmental code. Conflicts between the maritime transport sector and area-based marine conservation are due to the various direct and indirect impacts of maritime shipping on marine habitats and life. Noise pollution. Underwater acoustic noise generated by the shipping industry contributes to ambient noise in the ocean. Noise affects numerous marine species in many ways, including protected species and sanctuaries. Collision. Collisions between marine mammals and vessels are known as “ship strikes” and mostly affect large cetaceans. Ship strikes of cetaceans are an issue of growing concern internationally, and are likely to represent the main fatal threat for whales on global scale. Ship strikes also result in economic loss for the shipping companies due to costs of repair, impact on reputation, and timetabling issues. Accidental oil spills. Vessels can pose a threat to marine protected areas through accidental spills of oil or other toxic substances. Accidents that lead to the release of large quantities of oil can have major environmental impacts on a wide range of species, causing damage also to coastal environments and affecting sectors such as tourism and fishing. Discharge of hazardous waste and contribution to invasive species. 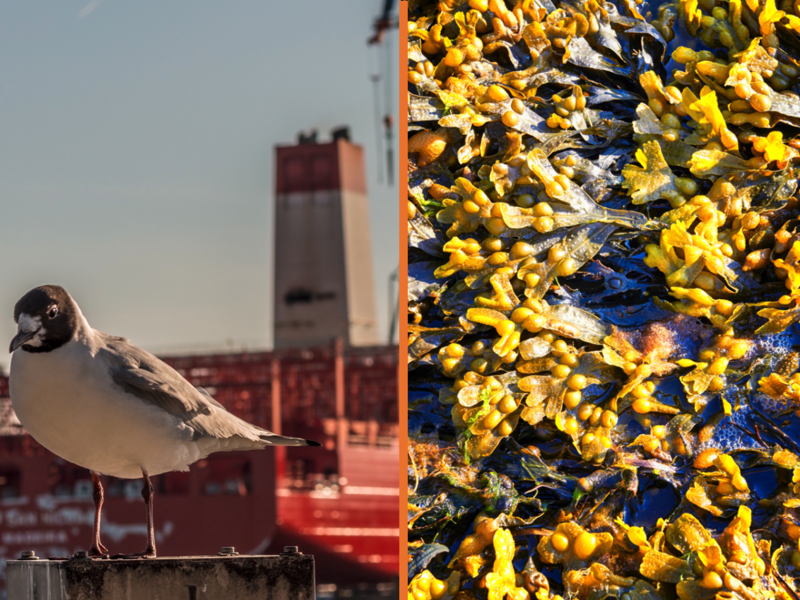 Vessels can pose a threat to marine biodiversity through accidental spills (of oil or other toxic substances) or through the periodic discharge of waste waters into the marine environment. Among all the ship types, tankers tend to use the largest ballast water quantities, followed by container ships. Exhaust emissions. Fuel oil used for maritime transport contains 3,500 times more sulphur than fuels used for onshore transport. Nitrogen emitted by ships contributes to eutrophication of the marine environment, which indirectly impacts on biodiversity. Physical damage to habitats. Vessels can negatively affect marine habitats and animals through the use of their anchors. In shallow areas, bottom sediment is resuspended, with impacts on surrounding benthic communities. Port expansion. Ports are expanding in response to larger vessel sizes and number, putting pressure on the natural environment. Some pressures only occur during the construction phase of ports, others such as port illumination are chronic, with negative impacts on biodiversity. Conflicts between the maritime transport sector and area-based marine conservation are strongest along shipping lanes and in areas with high noise pollution. Noise and chemical pollution can persist in the marine environment and affect animals and habitats far away from the vessels of origin. Shipping is considered a key maritime sector in the EU on account of the direct employment it offers and the role it plays in intermodal transport networks. The EU White Paper 2011 aims to achieve a 50% shift from road to rail and maritime transportation by 2050, likely leading to an increase in shipping in all European seas. Increasing economies of scale result in larger ships being built. This requires deeper and wider shipping lanes, as well as larger port infrastructure. There is also increasing competition between ports, forcing them to look for new investment opportunities and expansion. International environmental policy sets out ambitious targets for area-based marine conservation. The Aichi targets for the Convention on Biological Diversity stipulate that by 2020, 10% of marine areas, especially those of high biological and ecological significance, should be managed as protected areas. Other political drivers include the UN Sustainable Development Goals, especially Goal 14 “Life under water”, as well as EU-wide and national biodiversity and climate polices. In its MSFD the EU expects Member States to reach “good environmental status” of marine waters by 2020. A more strategic solution could be to use the PSSA designation to cover broader marine areas. In the Mediterranean for example, the Bonifacio Strait is the only PSSA. PSSA shipping rules would therefore apply more broadly, making it easier to implement regulations such as speed restrictions. The designation of alternative routes for shipping could be an effective and feasible strategy to reduce whale strikes within an area. This approach has already been successfully introduced for the protection of whales along the East coast of the United States as well as off the coast of Canada. It has also been introduced in Massachusetts Bay thanks to the collaboration between various stakeholders and the IMO, which redesigned shipping routes to avoid known areas with high concentrations of endangered whales. This reduced the risk of collision by an estimates 58 percent and increased shipping travel times by only 10-20 minutes. Developing so-called investigation areas for shipping, as was done in the Swedish MSP, is a way of indicating political intentions and providing a transparent information base further discussion. An investigation area does not imply any direct consequences for shipping, but is designed to lead to a better understanding of the problem at a specific location. It thereby provides arguments for developing spatial measures at a later stage, such as closing down a shipping lane for certain types of vessels or speed restrictions. It could also lead to the implementation of non-spatial measures, such as strengthening environmental legislation for particular sites. To reduce problems related to anchoring, such as habitat destruction, it can be helpful to designate dedicated anchoring areas also considering the safety of vessels. This can be a good measure to protect vulnerable and valuable marine areas whilst at the same time also ensuring the safety of shipping. Anchorage areas close to ports could also be linked with other, non-spatial measures, such as rules for disposing of waste water and other ship-based waste. As part of developing maritime spatial plans, speed restrictions could be agreed for ecologically sensitive areas to reduce the risk of ship strike. Certain MPAs already impose speed restrictions on ships; some even have a complete ban on navigation. In fact, speed restrictions and in particular mode, seasonal speed restriction, can greatly reduce impacts and risks. Moreover, the probability of death from vessel strikes also decreases when ships navigate at a lower speed. Navigating at a speed between 10 and 13 knots greatly reduce the risk of collisions and also reduce costs fuel costs for shipping companies. Agreeing speed restrictions would require major stakeholders to work together with IMO and related parties; MSP could provide a platform for such collaboration. REPCET is a software system which helps reduce the risk of collision between large cetaceans and vessels during daytime. Vessels equipped with the REPCET tool can note each sighting of large cetaceans to a centralised server, which then sends out an alarm to other ships equipped with REPCET that are likely to encounter the cetacean. REPCET has been used by several vessels navigating periodically inside the Pelagos Sanctuary, for example, and it is currently regarded as the most advanced technology for reducing collision in daytime. Such system could be implemented in more vessels through strategic partnership between interested MPAs, the IMO and maritime transport companies. Spatial data on cetaceans collected through the REPCET system could then be used in the MSP process. Another technical solution is to operationalise early warning systems and decision support system for accidental oil spills, ideally at regional sea level. To address the problem of noise pollution generated by the shipping industry, shipping companies together with stakeholders and the IMO are already promoting the use of ship-quieting technologies. MSP could act as a platform to encourage the use of such techniques and highlight advantages that could result to the shipping sector when doing so (e.g. potentially fewer restrictions). The shipping sector should be involved in developing joint solutions to mitigate impacts on the marine environment. Agreements can be made between shipping companies and MPAs or other authority to jointly implement good practices. It is important to increase public awareness regarding the impacts of the shipping industry on marine habitats and animals. Increasing awareness and training efforts for vessels crews is important as without their understanding of the problem and compliance, even the most advanced technologies will not resolve the issue. Tools that inform and engage stakeholders may help to improve compliance with mandatory and voluntary measures that are implemented to protect vulnerable species and populations.